The staple food of soft, white Idlis and large, crisp Dosas paired with hot Sambhar and spicy Chutney, has been as much a part of any Chennai-ite’s diet as… air? Visitors often dreaded meal times, because they did not want to have Dosa for the third time in the day, for the fourth day in a row, but were too overwhelmed by the warm hospitality of their ‘veshthi’-clad, earnest hosts to ask for a non-veg option. This despite the fact that the somewhat less populist, spicy and rich Chettinad delicacies of chicken, mutton and seafood would probably be available just around the corner! On a recent short trip to Chennai, I was curious to see what had changed since my last visit, 5 long years ago. A drive around the city revealed many more high-rises in the city and farmhouses in the suburbs, a lot more traffic on the roads, and a swanky new Metro rail system. 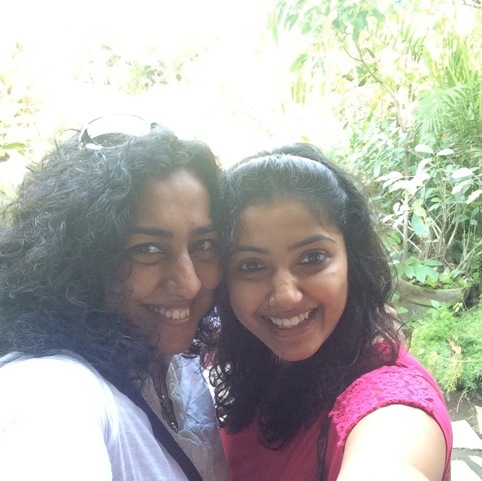 But my taste buds were in for a merry dance, thanks to my chirpy Chennai city guide, Sindhu Sreekanth, who unexpectedly opened up a whole new, vibrant culinary world for me! The Idlis here are soft, fresh, fluffy, melt-in-your-mouth. Try it with their unique Podi Oil, and you will want to return every day! Then go for the papery Masala Dosas, followed by a plate of the crisp Medu Vadas, and finally finish off with a tall glass of the deliciously cool ‘Jigarthanda’. 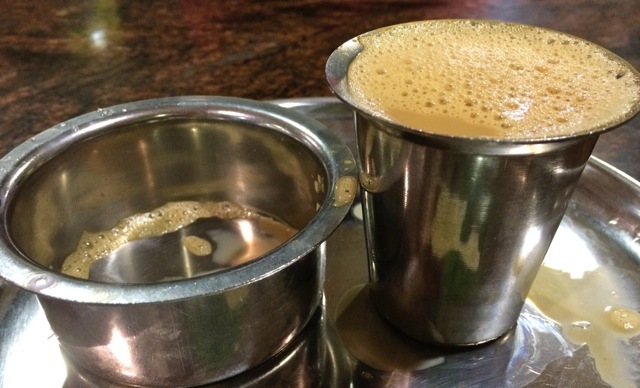 A cup of frothy filter coffee is a ‘done thing’ here, and after THAT breakfast you will WANT to do it! Set amidst verdant gardens, sweeping corridors and a plush lounge of a quiet and beautifully-appointed villa, bang in the middle of the bustling city, this place has as much great ambience as good food to offer. I tried the Oak Smoked Bacon and Tomato Galette, which was quirkily folded like a triangular Dosa, and tasted spectacular. The Grilled Vegetable with Smoked Scarmoza that Sindhu had was honest and refreshing for the hot summer afternoon. If you must finish with a dessert – of course you must! 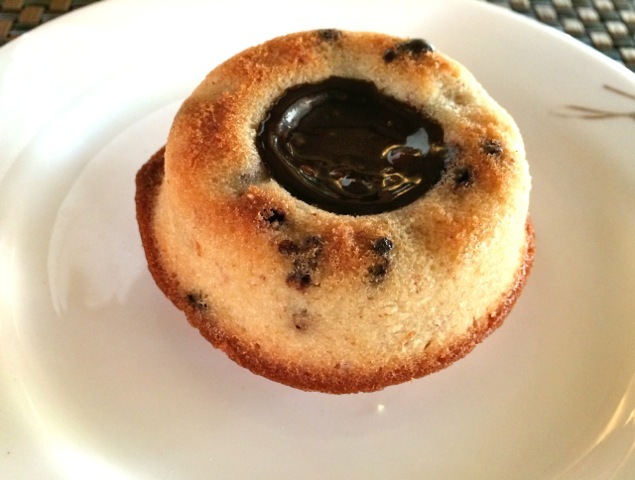 – the one to definitely go for is the Guava Apple Pie. Unless if you want to try one of their day specials, which are quite special! This is an establishment that has seen much better days in terms of ambience, but definitely not in terms of its loyal customers. 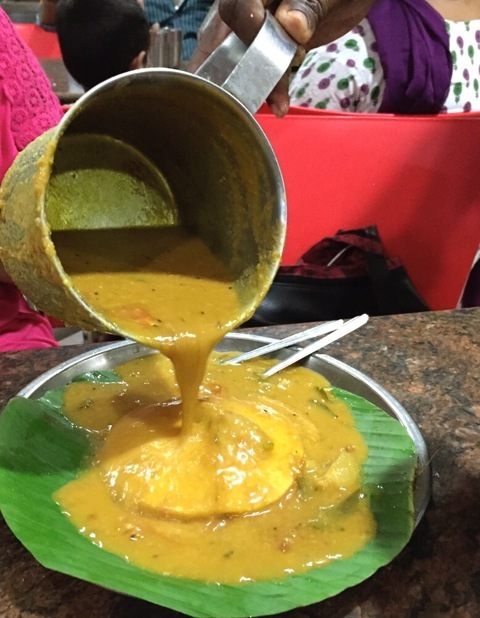 For thousands of old-timers, this is ‘that corner place’ for breakfast, anytime snack, or a late evening tiffin, serving traditional, biggish spongy idlis that will get drowned in a river of thick, hot Sambhar poured out of a large tin mug, right in front of your eyes! Chow down quickly and then sit back and sip on one of the best filter coffees I have EVER had! … and creates a piping-hot aromatic river around the islands of Idlis on your plate! The ‘South Indian’ filter coffee… unbeatable! Clean, stark interiors, old school ambience, polite servers and some excellent hot n spicy Chettinad food maybe their hallmark. 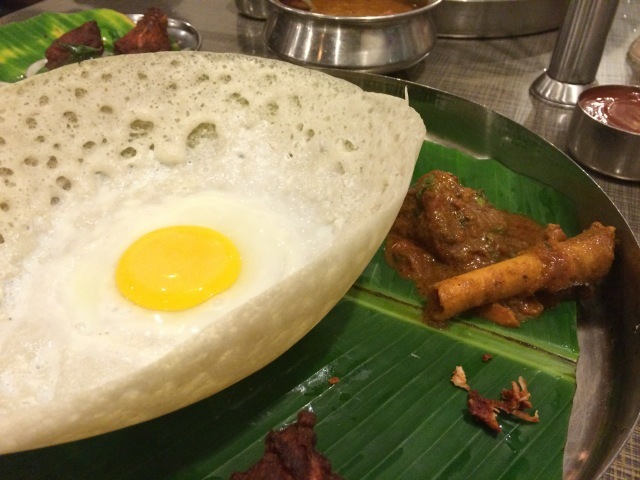 But the dramatic Egg Appam and the sharp, honest flavours of the Nalli Kuzhambu has made this place a must-do for all my Chennai visits henceforth. If it’s before midnight and you still have a corner of your tummy reserved for dessert (I always do! ), Amadora’s truly delicious hand-made gourmet ice-creams are the thing to go for. Even if you are bursting at the seams, you can’t pass up the fresh fruit Paletas that are the perfect cooler for a sultry night. If you were a little overwhelmed by the huge beach-going crowds thronging Murugan Idlis the day before, you will find Sangeetha a bit saner, but as delish. 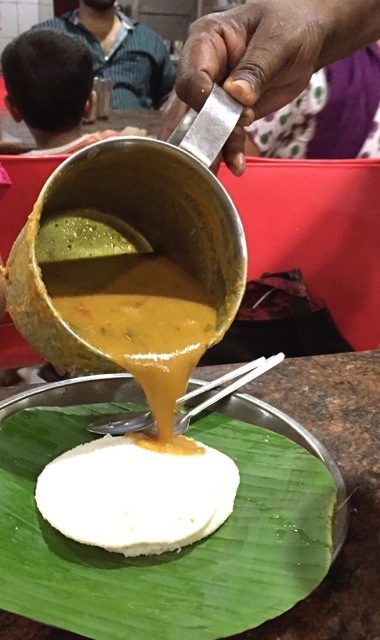 The Idlis are fresh and hot, the chutneys super, especially the red Tomato one, and one bite off the large Rava Onion Dosa and you will know why thousands of people visit around two dozen outlets of this restaurant spread all over the city! Oh, did I tell you I polished off 3 bowls of the Tomato Chutney here? A plush drawing room feel and a quiet, laid back ambience makes this charming cafe ideal for a lazy lunch in the middle of a busy day. The short menu offers mostly light bites like gourmet sandwiches, rich quiches and tall smoothies. But if you are a bit more famished, try the Mushroom Risotto with Ratatouille, or the Chicken Quesadilla, and taper off with a house-brew coffee! The humble-looking power-packed little dessert, Tigre! You NEED to go here for the rich and flaky Coffee Cream Mille Feuille, and the unassuming but bursting with flavours Tigre – a muffin-like cake made with Almond Flour, dotted with Dark Chocolate Chips. This place is all about timing. Come too soon after your evening snack and you will not be able to do justice to the huge variety of amazing Chettinad dishes here. Come too late, and you will not get any of their specials, or my favourites like Rabbit Biryani, Country Chicken Fry, Shark Puttu, or the MUST-HAVE Chicken Kotthu Parotha. The food is spicy, sharp and homely, and the price will probably make you go for Round Two! 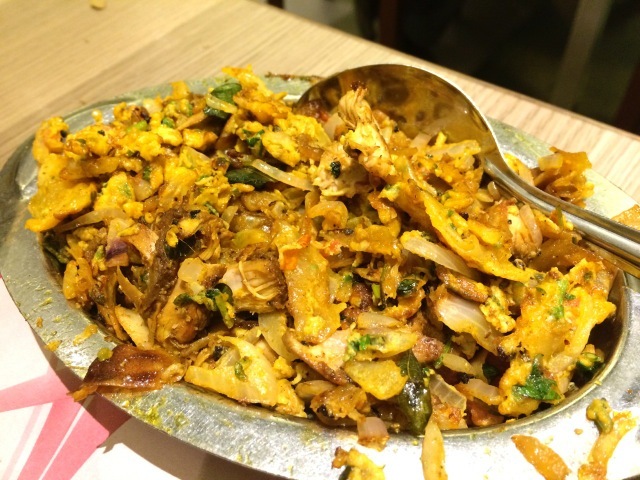 The delicious Kothu Parotha that you can’t stop eating! If you have an extra afternoon or night, try Peshawri at ITC Grand Chola. It is fine dining no doubt, and quite the experience for expats, because there’s no cutlery so you eat with your hand! But it does have some of the best kebabs… possibly in the country!